El apartamento ha sido amueblado con los más altos estándares y está completamente equipado para acomodar a cuatro personas (más un niño pequeño en una cuna). Hay pisos de mármol pulido en todo el apartamento, aire acondicionado regulable por separado y calefacción por suelo radiante (para el invierno). La terraza tiene una mesa de comedor Dedon, sillas y un sofá, una mesa de café y un diván. Puede tomar el sol en un clima agradable casi todo el año, estadísticamente hay 300 días soleados al año en esta área. 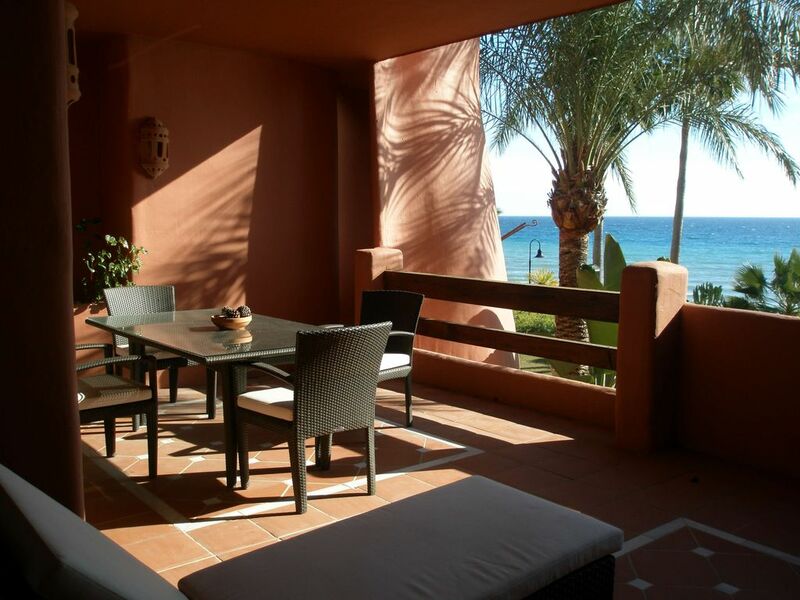 The apartment itself is fantastic, in a lovely beachfront location. Complex is modern, secure and quiet. We enjoyed cooking for ourselves as there is a lack of restaurants nearby. Also there are no shops nearby if you want to walk to get bread or milk etc. However these are the only negatives, everything else is great and we would recommend this apartment highly. Our visit was in mid October and so weather was changable and a lot of the “tourist attractions” were closed (no great loss in our opinion). The apartment is right on the beach with a lovely seafront promenade which became our daily walk, but the beach itself was not very appealing. There had been some storms just before we arrived so there was a lot of detritus/tree branches scattered around, but even without that the beach is very stony so not great for paddling. We much preferred the pools which were very quiet (possibly due to the time of year), although be aware there is no lifeguard on duty after the end of September! We wanted a quiet week away from The British autumn, and this apartment delivered perfectly. Sehr gut eingerichtetes Appartement in einer schönen gepflegten Anlage in ruhiger Umgebung mit sehr gutem Service. Unsere Vermieterin Elena war immer erreichbar. Unsere Erwartungen wurden im vollen Umfang erfüllt. I debated between a 3 and 4, because the apartment is lovely. Great view of the sea, huge deck, large living space, bedrooms and bathrooms. Very clean. Comfortable beds and the bedrooms have blackout rolling shades. Large table on the deck where we had our breakfast and lunch. The beach is not great however. No sand, all rocks and mud. There is a nice sidewalk for taking an early morning walk. But not a place where kids can play on the beach. We arrived and followed the instructions to obtain the key from the security guard. He was new and had no idea where the parking spot or the unit were located. The garage is built with very limited space, just driving through it was nerve racking, and we scraped the bottom of the car going in and out. After 40 minutes of driving and walking around we finally found the building and then found some parking inside the gated area but that was outside (not in the garage). So, the check-in experience was frustrating. To go anywhere you need an access key. Just to get to the beach you must go through 3 gates. We were provided two access keys for two couples, which is normally ok, but you couldn't even go to the pool without an access key. Which basically meant if one person was going to the grocery store, two were going for a walk on the beach, the fourth wanted to go to the pool and then needed to go back to the condo - too bad. No access key to get out of the pool area. When we got inside the condo, I used the restroom once, my husband used the restroom once, and the toilet paper was finished. There was no soap, no paper towels. I contacted the property manager and she texted me "you need to buy, this is not a hotel." Yes, but most properties at least provide one full roll of toilet paper. In the second bedroom the light bulbs were burned out in the side table lamps. We looked for bulbs but didn't find any. The microwave keeps running after the timer goes off. I didn't bother telling the property manager, because I was expecting another "this is not a hotel." The check-out time was 10 am. We were planning on leaving around 9 am or so. At 8:15 am the doorbell rings and the housekeepers are there to clean. I explained that we wouldn't be leaving for another 45 minutes. Again, just bad planning by the property manager. Accommodation was faultless but very disappointing lack of local bars/restaurants. The property was excellent. Nice and spacious and well equipped. Couldn't fault it. However be aware that there is very little in walking distance which is a pity. This apartment is excellent....the pictures don't do it justice! Rear bedroom has a pool view and main bedroom and living area look over the terrace which has a lovely sea view. Literally 20m from the beach....we went to sleep every night to the sound of waves lapping on the shore. There is loads of storage and the kitchen / utility is very well equipped. Main bedroom has a dressing area, and en-suite with heated floor. The beds are extremely comfortable (Tempura mattresses and pillows).....not slept so well in ages! There are a couple of good restaurants nearby along the beach, but you need a car to get to most places.....although taxis to Estepona (7 miles away) are easy to get and cost about 12 Euro each way. If you do have a car the private secure parking is under the complex and is right next to the lift which goes directly outside the apartment. We loved our stay here and would definitely book again if we holiday in this area. Thank you! I’m so happy that you enjoyed your stay at tithe place that I also love. We really enjoyed our stay here. The apartment is clean and spacious. The kitchen and utility room are well equipped. The location is superb. We drove to Gibraltar, Alhambra, Marbella, Puerto Banus, Tarifa, and Seville. I loved the large terrace with spectacular views. The amenities of the complex are well maintained and first class. Parking was secure and easy access. The pictures don't do it justice. Menara Beach es una urbanización en primera línea única en Estepona España. Como el nombre sugiere que este es uno de los desarrollos junto a la playa que se han establecido en esta parte de España y es también uno de los más nuevos. Menara Beach se terminó en 2002 y fue diseñado por uno de los arquitectos más reconocidos de España, Melvin Villaroel Roldan. El desarrollo está situado en la Milla de Oro y alcanzar no es un problema. Usted está a sólo 45 minutos en coche de los aeropuertos de Málaga y también Gibraltar y 30 segundos de la playa! El apartamento es un dos dormitorios, dos cuartos de baño contemporáneo apartamento de lujo, con acabados de muy alto nivel y viene con todas las características que usted esperaría. Cuenta con zonas de estar muy amplias, incluyendo una terraza donde se puede disfrutar del clima y algunos de los mejores y más maravillosas vistas panorámicas al mar Mediterráneo y en un día claro se puede ver Gibraltar y las montañas del Atlas a través del mar en África. La terraza se puede utilizar durante todo el año si lo desea para fines de entretenimiento. Hay tres piscinas que la comunidad puede utilizar, una de ellas cubierta y climatizada. También dentro de este complejo se encuentran una sauna y un gimnasio totalmente equipado. Usted tiene la oportunidad de probar uno de los más de 50 campos de golf que se encuentran dentro del área. Los jardines de Menara Beach están salpicadas de palmeras y arbustos. El desarrollo es segura y totalmente cerrada. Hay un garaje en el sótano para los habitantes de apartamentos y una plaza de aparcamiento en la calle para los visitantes. Hay una gran variedad de restaurantes en el área local, junto con tiendas de lujo. Puerto Banús está a un corto trayecto en taxi. Puerto Banús es también un lugar de casa durante varios yates más impresionantes del mundo. Estepona, rodeado de montañas y el mar, con sus 21 kilómetros de playa larga, pueblo Benahavis rodeado por montañas y el pueblo de San Pedro. El famoso restaurante de la playa Bora Bora, donde la princesa Diana y Bruce Willis han tenido sus comidas simplemente cerca. El casco antiguo de Marbella es el lugar perfecto para pasar una tarde de verano, tiene una serie de excelentes restaurantes.